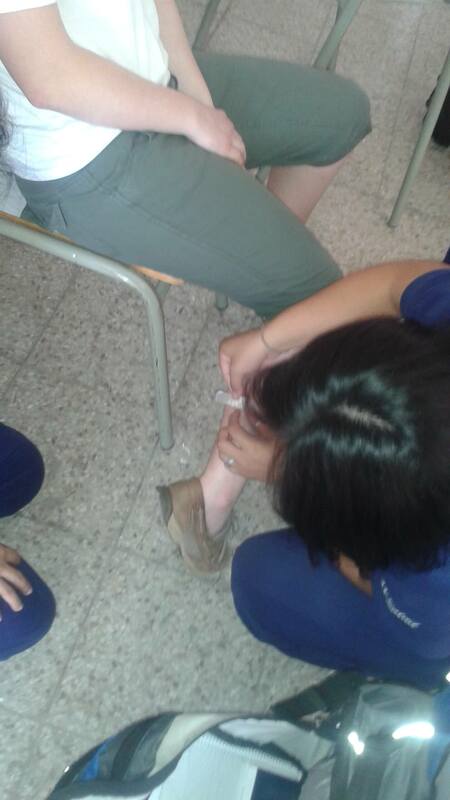 COAR High School Medical Track Students To the Rescue! In March 2015, a wonderful group of students from the College of Wooster visited COAR and taught English in the high school. It was a great visit. The College of Wooster students taught English in pairs with 4-6 COAR students at a time. That is a student-teacher language ratio of potentially 1:2. Wow! All of the students were engaged and enjoying both their immersion experience in English, but also, their opportunity to just spend time and talk with college students from the USA. Language immersion, solidarity and cultural exchange — what a trifecta! However, this group also gave the COAR Medical Track students a chance to apply their skills. 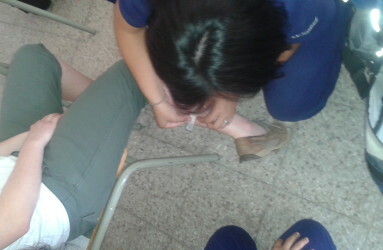 One of the visiting students cut her leg just before class. 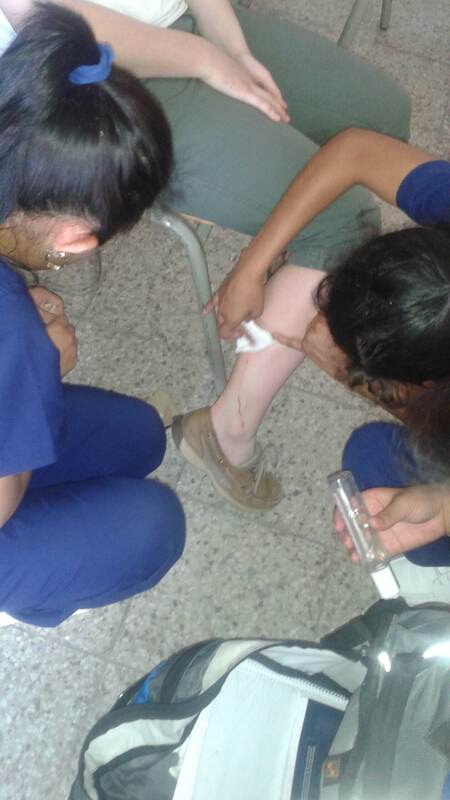 Instead of going to the Clinic, we asked the Medical Track students to apply what they had learned and treat their ‘patient’ (A task that simply couldnt happen in the US, unfortunately). 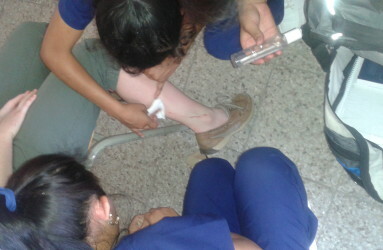 The Medical Track students quickly went into action. 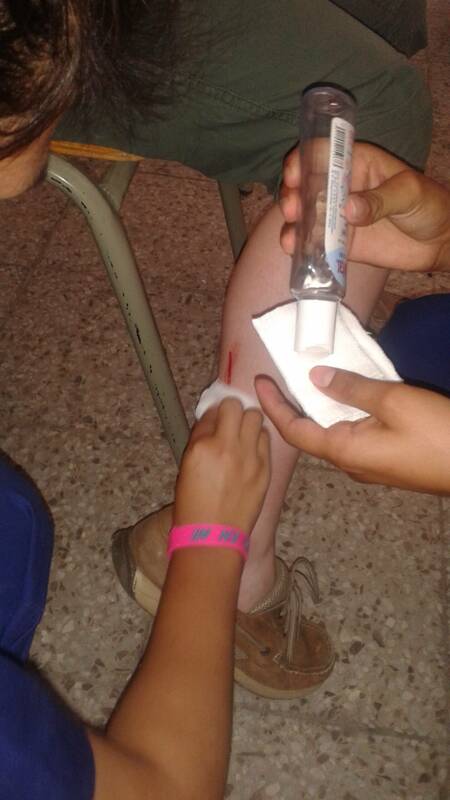 They cleaned the wound with antibiotic ointment (several times) and placed a bandage on the cut. While it was only a minor cut (with a lot of blood), this was a chance for the COAR kids to take initiative and apply what they have been learning. They stepped right up and worked together to help our patient. Medical Track high school students attend COAR’s school daily. In the mornings, they take the standard high school curriculum: language arts, history, science, etc. But, several days a week, after lunch, they have special seminars, workshops, tutorials or practicums. The Medical Track students wear traditional scrubs at school all day long. They work with professionals in their afternoon seminars/practicums to prepare them for a possible career in nursing or medicine. 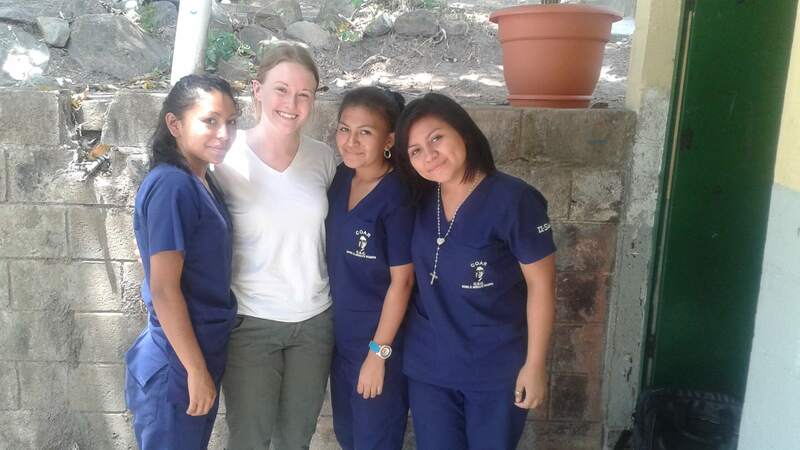 It is the school’s hope that this unique experience will not only give them some early experience in the medical field, but also, it will inspire them to work harder in school in preparation for their collegiate next step. There is a national entrance exam for the national university that can lead to a full scholarship for those who score very well. COAR is very proud of our high school Director who has taken the lead to create high school tracks that prepare kids for either work or certain career paths. In a country like El Salvador where the jobs are limited, this type of high school program can make the difference in a kid’s future. COAR currently offers programs designed to prepare kids for: Secretarial Jobs, Tourism/Hotel jobs; Medical professions; and a program to prepare kids for success in college. In a country ravaged by gang violence and poverty, we applaud the school’s efforts to motivate the kids and inspire them to stay in school and work hard. 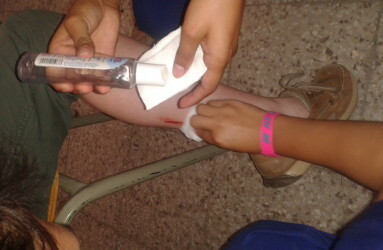 A pretty bloody cut - but, no fear, COAR kids to the rescue! Step one: a thorough cleaning and application of antibiotic cream. What appeared to be a long gash turns out to be a simple cut. Good News: No stitches needed. 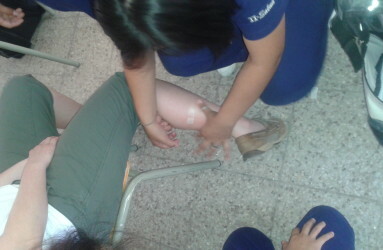 After cleaning the area, a simple band aid is all that is necessary and the patient is back to teaching English. 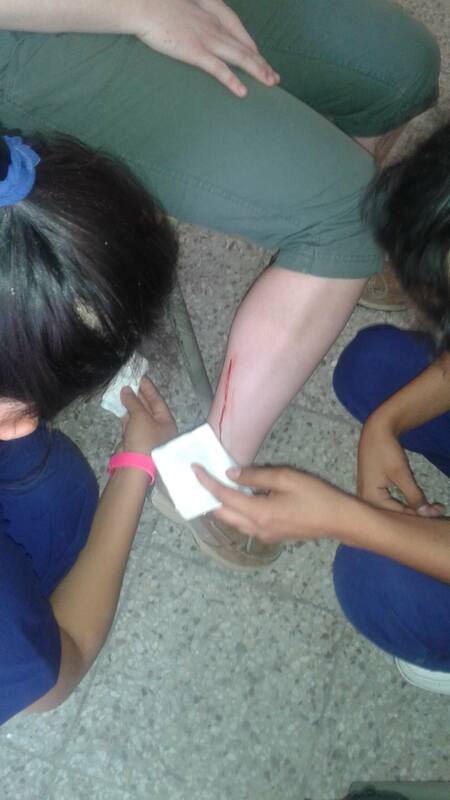 High School Medical Track students to the Rescue!